They say one shouldn’t dwell too much on the past, but when the past is as glorious as Raj Palace Hotel, an outrageously stunning reminder of the luxurious Rajputana era, you can’t really help it. The quintessential Indian opulence preens like a peacock. The larger than life lifestyle of the former Indian aristocracy had caused even the wealthiest of people to turn green with envy at that time and trust us the palace is still quite capable of stirring those feelings. The radiance of the bygone era is still reflected in the castle with its velvet sofas, silk drapes, rare wood furnishings, artefacts, glass chandeliers, ornate doors and pillars. Every inch of Raj Palace Hotel is fascination materialized. So extravagant that some might even mistake it for arrogance. But that’s just the surface story, once you experience its warm hospitality, you will fall in for it and everything about it. As you make your way to it, you sneak into the world of heritage magnificence and leave behind the chaos and cacophony of Jaipur. 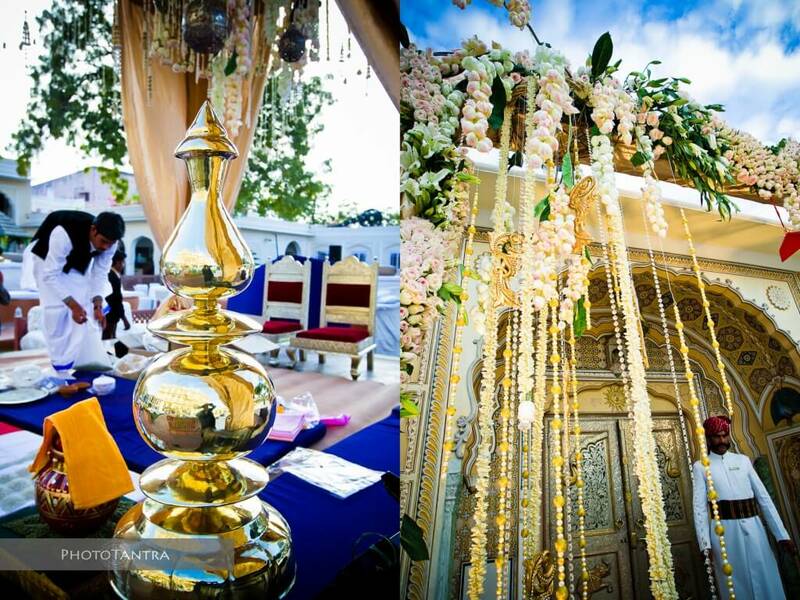 Your wedding here would be like a trip back in time, oozing of royal charms and grandeur. Though that would be a reason enough to plan a wedding here, but let us give you a few more to help you have a clearer picture. This is unlike any other hotel stay; odds are you would feel like a guest of the royalty. It is an all-suite property, none of which are alike, each with its own individuality and story to tell. The rooms are done with sumptuous Rajasthan arts like mirror work, hand painting with gold and silver ornamentation. A special mention must be given to the in-suite museums and housing collections of the royal family which could be something like the original Chanel No. 5 circa 1930 or the throne of Thakur Sahib, giving you the glimpse of how the royalty lived. You and your guests would love the regal rooms and might end up spending a lot of time in the private sit outs savouring the tranquilizing views of gardens or courtyards. The sprawling Char Bagh lawns against the backdrop of the palace façade would be a great choice for your nuptials. We also like the Maharani lawn that has a rather peculiar character, a huge courtyard surrounded by the cannons of the palace with the adjoining hamam pool, for shamiana lunches or brunch at the poolside. Its courtyard Moti Chowk with fountain in the middle is a breathtaking spot for mehendi and haldi ceremony. You could have a fun cocktail evening at their Fountain courtyard, which has a kebab shop with live kitchen and the blue pottery fountain. 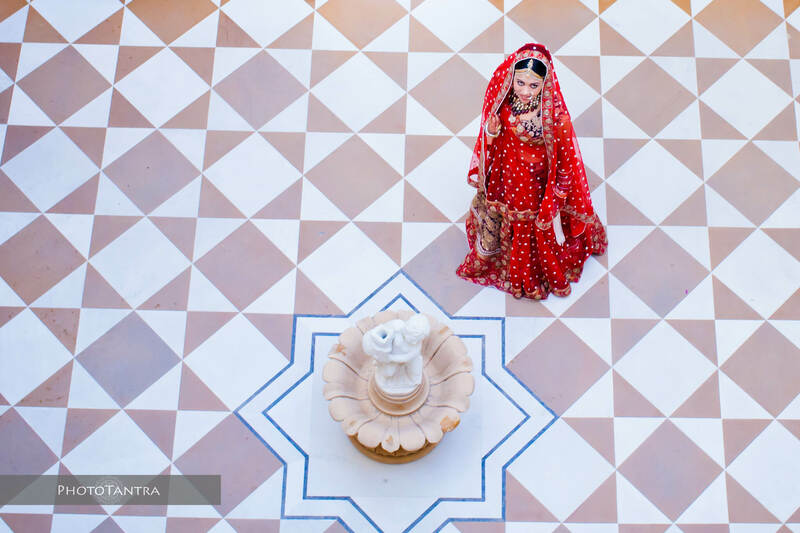 Or if you like you could choose from the courtyards Diwan-E-Aam or Diwan-E-Khas with Italian marbles for your sangeet ceremony or intimate weddings. A few fun and quirky elements. The life size chess game in the courtyard is the best photo prop for your pre wedding pictures. The puppet shows are Rajasthani way to narrate folk tales and the tradition is very much alive and become a necessary routine after the meals at the Raj Palace. Or you could take a royal baggi safari to the Jal Mahal, a palace amidst the Mansagar lake and savour a leisure afternoon with your guests. 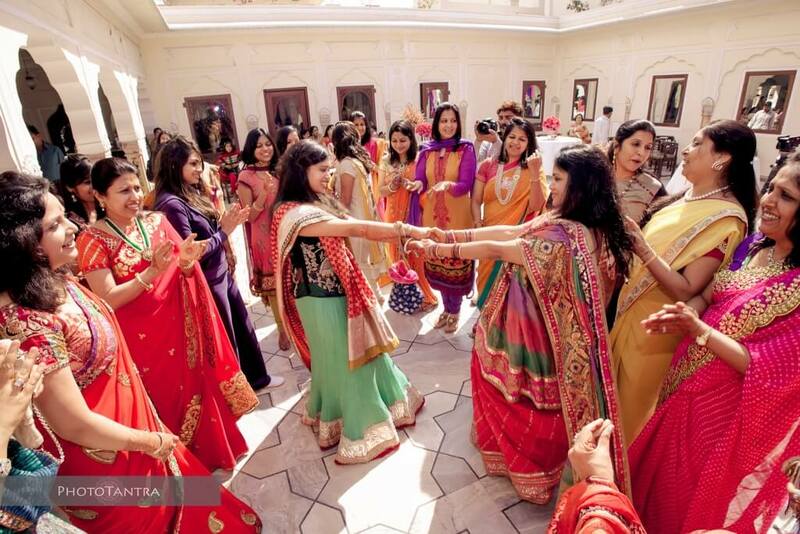 Larger than life is the signature style of Raj Palace and you would be spoiled bad, so bad that you would be glad that you hosted the most memorable event of your life here. We hope you enjoyed our special series on wedding heritage hotels of Jaipur – Samode Palace, Taj Jai Mahal Palace and Raj Palace Hotel. We will keep sharing our love for weddings more so destination weddings. PS. All the amazing images used in this article are captured by Vinayak Das of PhotoTantra.